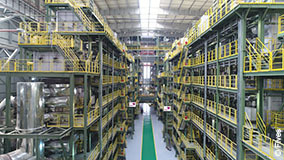 Fives developed the NeoKoil® strip processing lines for carbon steels: continuous annealing and galvanizing lines (CAL, CGL, CAGL) to produce high-strength steels (AHSS, UHSS); continuous galvanizing lines (CGL) with horizontal furnaces to produce steel grades from building to automotive applications quality; combined galvanizing & painting lines (CGPL) and color coating lines (CCL) dedicated to the construction, home appliances and white goods applications. For stainless steel: hot & cold annealing and pickling lines (HAPL, CAPL), bright annealing lines (BAL) and induction bright annealing lines (I-BAL). For silicon steel: annealing & pickling lines (APL) and annealing & coating lines (ACL) for NGO grades, and decarburizing & coating lines (DCL) and flattening & coating lines (FCL) for GO grades. Fives also provides a wide range of assistance in grade development, process and quality improvement to reach steel process optimization and operational excellence in terms of the lowest cost of operation, highest quality steel grades and best route to market. Fives provides mechanical solutions from the entry coil handling section all the way to the exit for any type of NeoKoil® strip processing lines: carbon, stainless, silicon. Fives offers environment-friendly degreasing systems and pickling solutions for all steel processes. Fives proposes a range of proprietary thermal and cooling technologies, as well as induction heating solutions for strip processing lines.